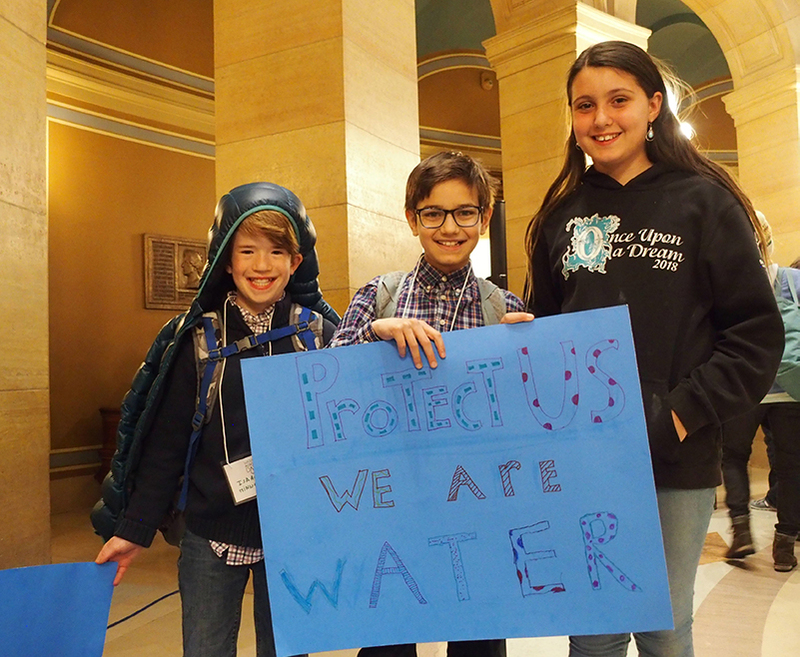 Our youngest speaker at the Water Action Day rally was a 5th grader from St. Paul, William Chatterjei (middle), with a powerful call to protect our water for future generations. Thank you to everyone who participated in Water Action Day 2019! Despite the sudden spring snowstorm, over 450 Minnesotans from across the state joined us at the Capitol for a day of action and advocacy. Together, they attended trainings on a range of issues, wrote letters to newspapers, met individually with almost a quarter of the Minnesota legislature, participated in the first Environmental Town Hall and rallied for clean water. One thing that stood out to many FMR staff and River Guardians was the shared understanding around the importance of growing more clean-water crops to protect our rivers, lakes and drinking water. Many participants and legislators addressed this issue in small group meetings, and it was prominent in the rousing Clean Water Rally in the rotunda. FMR Executive Director Whitney Clark spoke about the attention to this issue: "A few years ago, people were really curious about this connection between cropping practices and water quality, but it was hard to imagine what I just saw: The Capitol rotunda full of people not just applauding but cheering and whooping as a rural representative, Rep. Todd Lippert, and state Commissioner of Agriculture Thom Peterson spoke to the importance of programs like Forever Green to support farmers, our rural economies and reduce the biggest source of pollution to the Mississippi River." 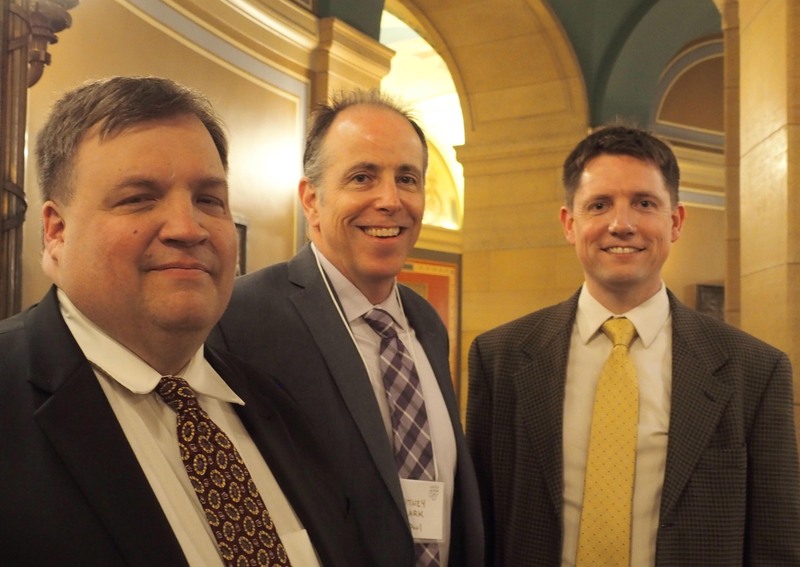 Supporters of clean-water crops: (L to R) Minnesota Department of Agriculture Commissioner Thom Peterson, FMR Executive Director Whitney Clark and Rep. Todd Lippert of Northfield at Water Action Day 2019. 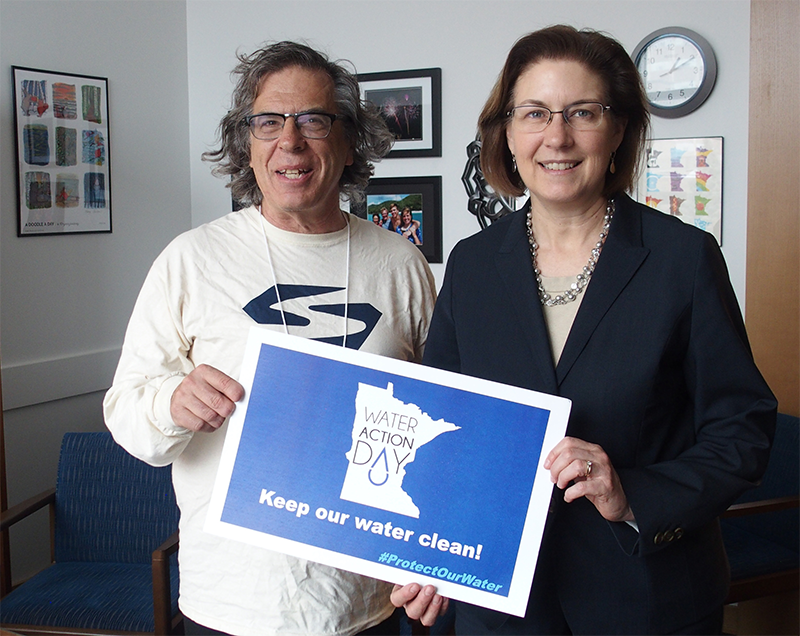 “Every Minnesotan deserves safe drinking water — no matter who they are or where they live. We want to be sure the state has the resources it needs to keep us safe,” says FMR Water Program Director Trevor Russell. One of these resources is the state’s Safe Drinking Water Fee. The annual fee, currently $6.36 per connection, funds the Minnesota Department of Health’s work to test water, inspect water systems and solve critical drinking water problems. Inflation has increased by 28% since the fee was last adjusted (in 2005), reducing the state's ability to conduct this work. Water Action Day participants asked their representatives to approve a fee increase in accordance with inflation. To protect drinking water we must also invest in water infrastructure and support lead-free homes. There are also many related opportunities for legislators to invest in the future of water in our state. These topics drew a crowd from a diverse range of interests and expertise, from climate change to pollinator health advocates. This year, at Water Action Day and beyond, people who care about clean water are asking their legislators to set a statewide goal of achieving 100% clean and safe surface water by 2040. Other issues that fall within this priority include reinstating the Minnesota Pollution Control Agency Citizens' Board, requiring proof that sulfide mining won’t pollute our waters, and protecting wild rice. Legislation to reinstate the Minnesota Pollution Control Agency Citizens' Board was especially embraced and promoted by Water Action Day participants, who made it clear to state agencies at the Water Town Hall that they value opportunities for the public to be involved in environmental decision-making. (L to R) FMR SuperVolunteer and River Guardian Sarah Musgrave met with Sen. Melissa Wiklund of the southern Twin Cities to discuss reinstating the Minnesota Pollution Control Agency Citizens' Board and the importance of supporting farming practices that benefit our water and farmers alike. As most of the planned buses arrived from Greater Minnesota — only one had to turn back right away because of the blizzards — Water Action Day kicked off with breakfast and coffee at our home base of Christ Lutheran Church across the street from the Capitol. Throughout the day, activities at the home base included a Wisdom Table, where participants could talk to issue experts, a Letters to the Editor table, a social media photo-station, and question collection for the Water Town Hall. After breakfast, training sessions and issue briefings began. Issue briefings were led by experts from The Nature Conservancy, Land Stewardship Project, Sierra Club, WaterLegacy, Friends of the Boundary Waters and Lutheran Advocacy Minnesota on topics like factory farms, sulfide mining, tar sands and graceful engagement. Our own board member Marcia Avner led trainings on effective lobbying (watch the video on youtube!). Stephanie Pinkalla of The Nature Conservancy briefs Water Action Day participants on the issue of healthy lands for healthy waters. We were able to make appointments with 142 legislators (making up 71% of the legislature!) to discuss protecting clean water this session. During these meetings, Water Action Day participants discussed policy priorities with their state house representatives and senators. Afterward, advocates graded their legislators on their positions on clean water issues and shared that information with organizers for follow-up. New this year was the Water Town Hall. People from across the state packed the room to ask questions and engage with a panel of agency leaders. For people who did not get a chance to talk with their legislators, this was an opportunity to ask direct questions to several of the major decision-makers for water in the state. Topics included pipelines, indigenous participation in state decisions, reinstatement of the MPCA Citizens' Board, invasive species, climate change and more. Audience members at the Water Town Hall had the opportunity to ask questions of representatives from five different state agencies. The last event of the day was the annual Clean Water Rally in the Capitol rotunda, emceed by Don Arnosti, Executive Director of Izaak Walton League. Speakers this year included Reena, a 14-year-old Ojibwe Water Walker from southwestern Minnesota, Rep. Todd Lippert, Willa Childress from the Pesticide Action Network, Commissioner of Agriculture Thom Peterson, William Chatterjei — a 5th grader from Sunny Hollow Montessori in St. Paul. At the rally, Reena, a 14-year-old Ojibwe Water Walker, asked attendees how we would protect our water. Though participants came from across the state and represented a wide variety of issues, uniting around a common goal of clean water for all made for powerful visibility. A huge thank you to everyone who helped make Water Action Day 2019 possible and everyone who attended! 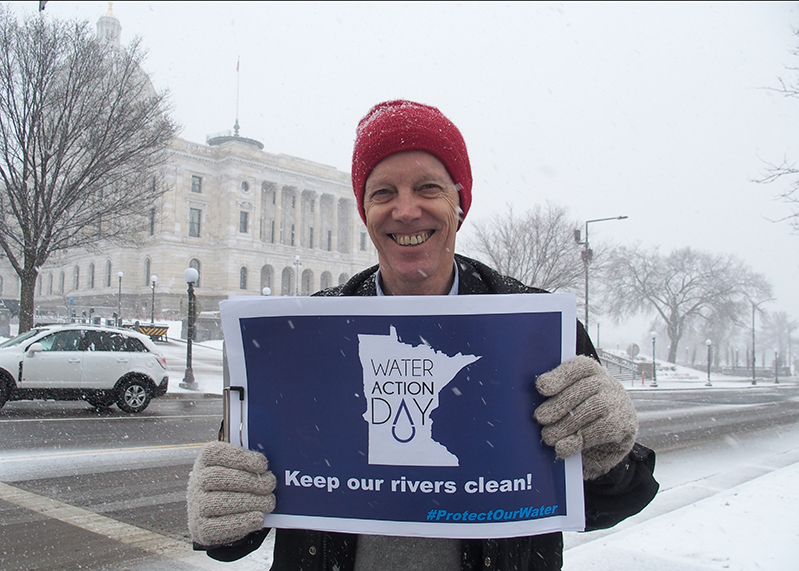 Together, we're sending a strong message to our legislators that Minnesotans care about the future of our water. Water Action Day 2019 was made possible by the following 31 sponsors and 18 supporter groups. Sponsors helped fund the event and assist with organization and promotion. 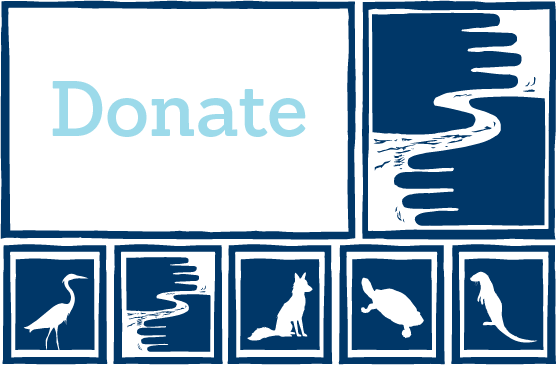 2019 sponsors included: Anglers for Habitat, Audubon Minnesota, Clean Water Action, Clean Up Our River Environment (CURE), Coalition for a Clean Minnesota River, Conservation Minnesota, Duluth for Clean Water, Environment Minnesota, Environmental Working Group, Fish & Legislative Wildlife Alliance, Friends of the Boundary Waters Wilderness, Friends of the Cloquet Valley State Forest, Friends of the Mississippi River, Friends of Pool 2, The Humane Society of the United States, Izaak Walton League, Land Stewardship Project, League of Women Voters - Upper Mississippi River Region, Minnesota Center for Environmental Advocacy, Minnesota Conservation Federation, Minnesota Environmental Partnership, Minnesota River Congress, Mississippi River Network, Our Revolution - Minnesota, Pesticide Action Network, Pollinator Friendly Alliance, Save Our Sky Blue Waters, Save Lake Superior Association, Save the Boundary Waters, Sierra Club Northstar Chapter, WaterLegacy. Event supporters helped promote the event and assisted with coordination and organizing. 2019 supporters included: American Sustainable Business Council, Alliance for Sustainability, Cannon River Watershed Partnership, Environmental Coalition at St. Olaf, Environmental Justice Coordinating Council, Environmental Student Association at the U of M, Honor the Earth, Lake Pepin Legacy Alliance, Minneapolis Area Synod, MN350, The Nature Conservancy, Public Policy Project, Take Action MN, Transition Longfellow, Trout Unlimited, The Water Bar, Wilderness in the City, Women’s March MN. Many of FMR's victories are thanks to our strong base of advocates. Sign up to become a River Guardian, and we'll email you about events like Water Action Day and when important river issues arise. We make it quick and easy to contact decision makers. River Guardians are also invited to smaller special events, including happy hours, about important legislative and metro river corridor issues.